There’s no telling when or where you’ll fall into a bit of trouble. It could be while you’re walking home from a friend’s house late at night. Or maybe it’s while you’re wandering around a town on vacation. It could happen when you’re walking back to your car in a deserted parking lot. Wherever you are or whatever you’re doing, you need a means of self-defense. Something to protect yourself from an attacker. It’s something you did as a kid for fun and now it can save your life as an adult – tying knots. Various expert sources place emphasis on the same types of knots as lifesavers in outdoor situations. Well, today I’ll tell you about a few of those important knots and show you how to tie them like a pro. 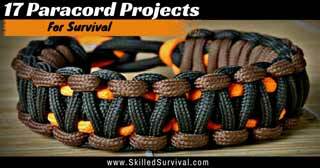 Name one survival item with more uses than some high-quality survival paracord. Done? Well, I bet the first items that came to mind were a good survival knife, a survival hatchet, multi-tool or duct tape; and you’d be right. However, today I’m going to argue that paracord belongs in this “many uses” category as well. When left intact, paracord has lots of important survival uses and if you unweave the threads of the cord, the number paracord uses grows. Paracord is one of my favorite survival tools. It’s strong, it won’t deteriorate over time and doesn’t absorb water.